I`ve now been in Laos for about 5 days and it`s been a revelation/ I know I only changed borders but I might as well be on another planet for the experiences I`ve had so far. I spent 4 nights at Si Phan Don (4000 islands) a region of the Mekong River where theres a sharp drop in elevation, the river widens out and there`s a maze of all these small islands, sandbars and clumbs of vegetation. I get off the boat. The most anyone can do is rotate their neck in my direction. You want a room - find it yourself! Ordering a pineapple shake. Wai 20 minutes before being told, `No Pineapple`. Getting a boat to the dolphins & the boat driver rolls his eyes as he slowly is called up from his chair, and you know full well he just wants to sit in the shade all day. 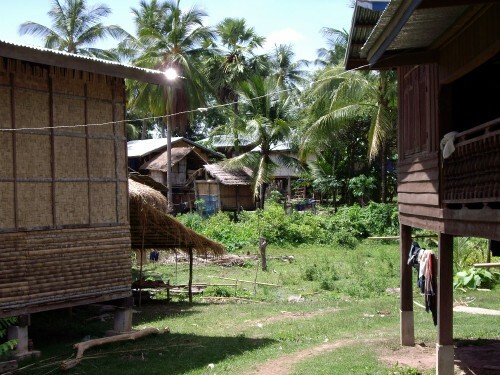 I spent my time on Don Det, the most tourist dense of the islands with about a km of bungalows lining the banks (a wonder they ever got made). It`s a fairly havey backpacker area, with people coming and going each day, so it was a great place to meet people, kick back and not do much else! Spending 4 hours on morning investigating hammock lying positions and periodic motion. Eating pineapple so juicy it nearly dissolves in your mouth. Waiting 45 minutes for a plate of spring rolls. Hearing `Sabaidy` from every corner as you take a bike ride through the island. Nightly lightning shows viewed, again, from my bungalow hammock. Eating fish steamed in banana leaf (to be ordered 2 hours before!) surrounded by a rainstorm on the Mekong. So all in all a good 4 days spent, especially after 2 days of constant travelling and 3 days of temple exploring!